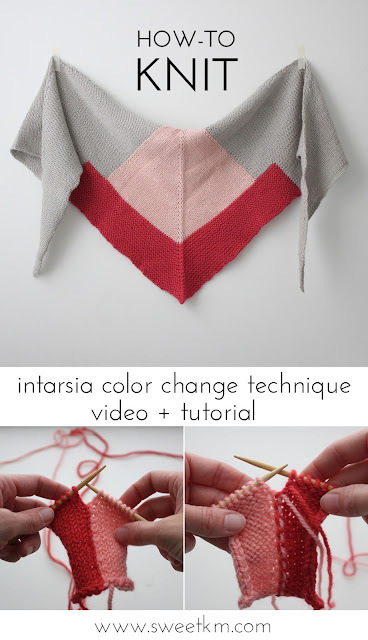 Intarsia knitting is when you use multiple colors to create a shape with in a ground of a different color. It's often used when creating a picture on a knit, like the vintage Christmas stocking I knit for my family. The color change technique is also used in fair isle knitting patterns (also called stranded knitting), which is usually a small repeat of geometric shapes in different colors. While both the classic Intarsia shapes, and Fair Isle repeats are beautiful, it's not the only reason to switch between yarns. 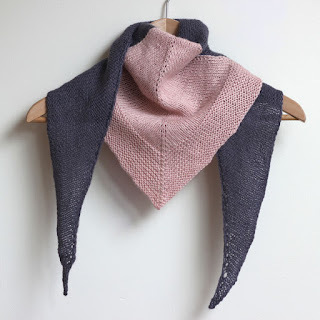 In my Shape Shifter Scarf pattern I use the blocks of color to define different shapes within the scarf. It's a simple pattern, and here is the technique to make the simple color change along the same row without leaving a hole in your fabric. I've made a short video tutorial to help demonstrate the technique. Check out the video above, or the photo tutorial below! I'm going to demonstrate on the wrong side of the work so you can see what is going on. I have already purled across the dark pink, which is the color we are stopping. Before taking the first stitch of the light pink, which is the color we are starting, I'm going to twist the dark pink over the light pink. Then I make the first stitch. As you can see, the first stitch of the light pink, has captured the working end of the dark pink, locking the two colors together. Now I can continue working the light pink, when I come back to the dark pink on the right side of the work, I do just the same thing. - You can also use this technique when the color change slants to the right. When it slants to the left, there is no need to twist, just drop the yarn and go on with the next color. - Always do the twisting on the wrong side of the work. If you are working a stitch pattern where the working yarn is on the right side of the work, move it to the back to execute the color change. As you can see in the last photo, the twist creates a vertical line of stitching, which may be unsightly on the right side of the work. - Be sure to pull the first stitch of the new color firm. Loose stitches create a ladder effect along the color change. -Twisting the yarn together causes the working yarn of the two colors to twist. Take a break every few rows, and untwist your working yarn.